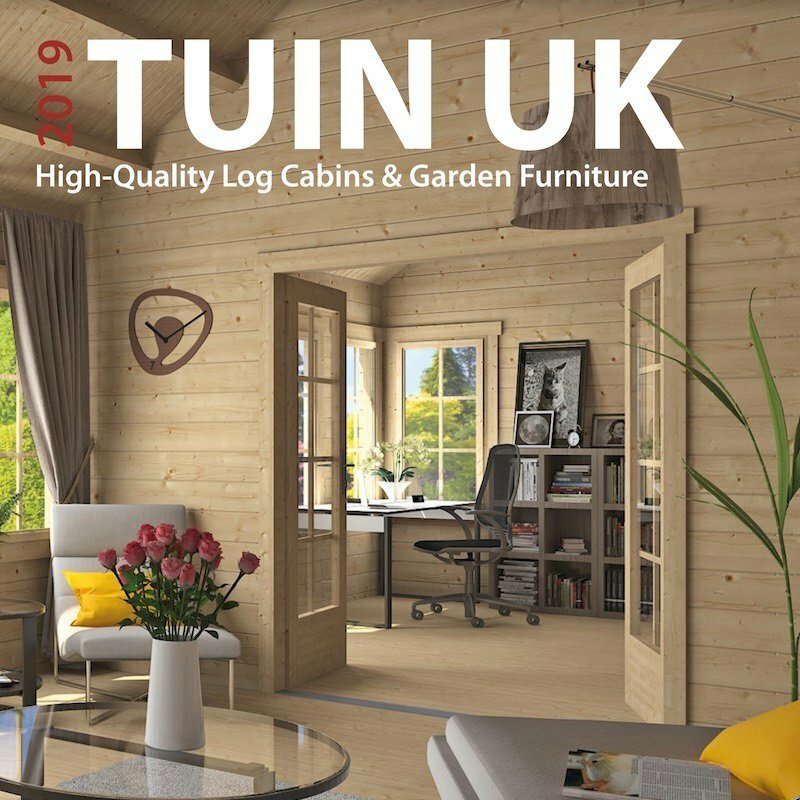 Tuin : Tuindeco Blog | Log Cabins and Garden Products, Advice and Information. My colleague Megan publishes posts sent in by customers and will highlight any unusual offers, interesting products or relevant subjects. Hopefully you will find our content interesting and it helps you. It’s great when people join in with their own post or give their comments, ask questions or detail their own thoughts and advice, it is much appreciated by everyone. ? 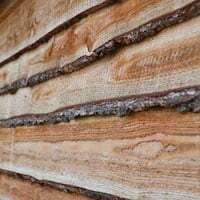 Fitting Tips for Log Cabins. 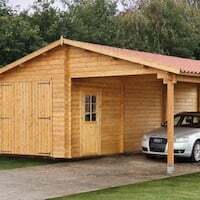 19mm – 28mm Log Cabins. 34mm – 45mm Log Cabins. 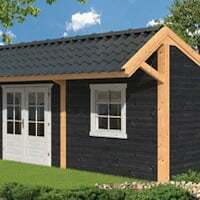 70mm Log Cabins and information. Tuin website and general information. Highlighted Special Offers and Deals. Roofing Products Tips and Ideas. Garden Furniture Tips and Ideas. 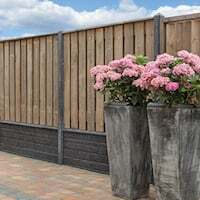 Garden Decking Details and Tips. 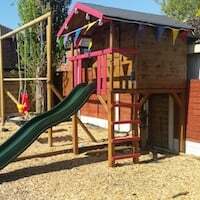 This entry was posted in Customer Reviews and tagged customer reviews, review, reviews, Tuin, tuin reviews. Bookmark the permalink. We’re quickly approaching summer. Days are feeling warmer as the evenings get brighter, but we aren’t quite in the Summer season yet – That also doesn’t mean that spring isn’t a good reason to have fun. I’m sure you’ve heard of the term “Dining alfresco” although it’s not a direct translation from Italian, it’s often referred to as “Dining in the cool” or “Outdoor dining”. Although if you were to use the term “al fresco” in Italy, you could be asking to dine in jail – So be careful! We’ve seen plenty of our customers use our products to create the ideal outdoor dining scene. Since Spring is the ideal season for Al fresco dining, I wanted to create a collection of examples to inspire you on the essentials for outdoor dining. 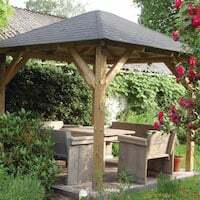 Our Barbara Log Cabin Gazebo is one of the few in this style of gazebos, perfect for transforming your garden corner – The Log Cabin Gazebos are the ideal size for a corner sofa and coffee table. Perfect for the more casual dining events. For those that don’t have a lot of space in their garden – The Tourist Gazebo measures 3.4m x 3.4m and is perfect for providing shelter for you and your loved ones. 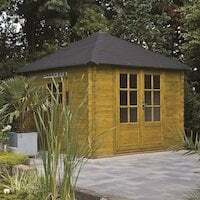 Featuring a traditional apex roof design, it’s easy to see why this Gazebo is so desirable. Our team here at Tuin can all agree that the warmth from Larch timber is very aesthetically pleasing, that’s why a fair amount of our Gazebos also have a Larch twin – For those that want to bring warmth in their garden. 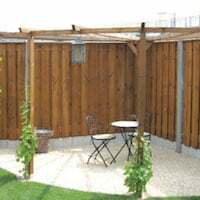 This Samos Larch Gazebo has been modified with the Larch Cladding wall infills, but it’s an ideal way to add some privacy to your outdoor dining set up. 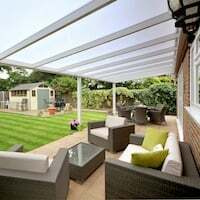 We also understand that not everyone desires the apex roof type, for a more modern garden we also have some Modern Pent Roof Gazebos. Get all the family around the table with the Excellent Modern Gazebo – Measuring at 5.92m in length, you can host your alfresco experience for everyone, while gaining the envy of the neighbours. This Gazebo had been modified with See Through Walls for an extra level of privacy and sun shading. Now that we have our shelter covered – What about the seating? We offer a range of Garden Dining Sets from rustic/shabby chic styles to wicker furniture. Here’s a select few that would look both stylish and provide comfort. Beverly Wicker Dining Set is one of the four wicker options we have in this range, featuring a glass topped table – You can dine in the ultimate comfort with these cushioned reclining chairs that are included in the set. A perfect pair with our Modern Styled Gazebos, the Montgomery Dining Set is extremely sleek in design. It also features a comfortable but powerful combination of Textilene and Quickdry foam to ensure years of use- even with the unpredictable weather. Or, if the other styles in our range just doesn’t quite suit your taste – You can find the ideal set up with our Create Your Own Garden Dining Set. This product page allows you to pick either a modern or rustic styled table in a number of styles. As well as choosing the number and style of wicker chairs to complete the set – Ideal for when you host large dinner parties. Even in the summer evenings, a chill may dampen the dining atmosphere, so why not think ahead with a heating solution? We have a range of Garden Heaters that would be compatible with your gazebo, from free standing to overhead heaters. Soft furnishings like cushions or blanket throws are an easy say to subtly sneak a theme in. For example, these customers who wanted to continue the warmth brought from the Samos Larch Gazebo with the uses of a soft yellow, green and those rich teal flower pots. Alternatively, you could use the soft furnishings to add a pop of colour to your setup. Reds, Oranges and Blues would make a bold contrast against our wicker furniture. 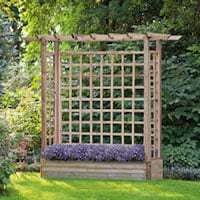 Another idea is to introduce more natural elements to blend the scene in with your garden – Like with this Curved Lattice Gazebo where the customers introduced both planters and hanging baskets for subtle, but definitely effective pops of colour. Or for our all-night events, why not experiment with some lighting? 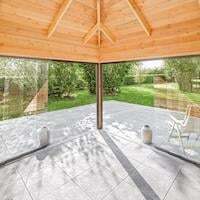 We do not offer electrics in our own installation service, but with the help of a qualified technician- You could certainly upgrade your wooden gazebo with a touch of modern technology. Imagine colour changing light bars that you could set the ambiance with? So now that the area has been set up, with all the finishing touches – I’m certain that your dining area looks great… But what to serve alongside it? I personally would go for this Teriyaki Salmon Noodle dish to get those taste buds in action, paired with a fruity Pinot Noir to complement the dish. Is al fresco dining not just for you? 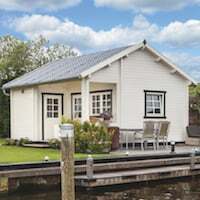 Why not take a look at our Log Cabin Pubs inspiration post, or maybe you would prefer looking at how our products can be utilised for Hot Tub Covers.